As always, when I go to my FLGS (Game Vault), I end up sitting around talking about how I painted this or that or what I would do for a particular result. I could sit around all day and talk shop. This is one of those cases. One of the guys a few weeks ago asked me about painting. I forget the exact question, but it came down to this, I told him to let me borrow his mini and I would do a couple of real quick things with washes to make it come "alive." I wanted to show him just how easy it is to add a few washes to a model and really make it come together. Now I limited myself to using just GW washes and the original base colors he used so that when I gave the model back, he could reproduce the same results on his other models with little to no extra work on his part. I didn't "clean up" any painting or make any "corrections" to the model. All I did was add a series of quick washes and highlights. Simple, he had all of the base colors there. All I did was add a wash or two to individual areas and then go back with the base color to add depth. For example, the metal areas. Already based with Silver, all I did was wash with Badab Black and then go back and drybrush the original Silver back over that. 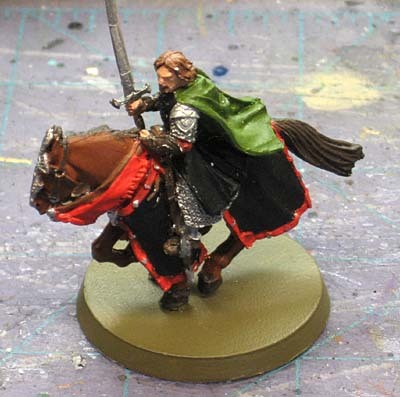 Same for the cape, already based, I went in and added two washes of Thraka Green and then went back and added the original color to the tops of the folds of the cape. And it was like this for the whole model. Each area got a wash or two with a highlight. In short, using washes can be a great way to add some depth and life to your models. It doesn't have to be difficult or some crazy formula either. I didn't thin them or use and crazy combination of colors or add any painting mediums or anything like that. I think sometimes people look at models and think it's too hard to get the result the see or think they just can't do it. You don't need to be an 'Eavy Metal Painter or a Golden Daemon winner to have good looking models. This is why I've loved those washes since the preview copy. In our Vietnam game last Saturday, before playing while everyone was admiring everyone else's armies, someone said "what did we do before Devlan Mud?" Washes improved my models tenfold. When I had to make them myself, application was rare, but now that they are readily available, every one of my models looks ten times better. Charles: What a good question. Ben: It doesn;t take much and it's suprisingly easy to do really. Mordian7th: The real trick is moving past just washing (read: dipping) everything with Devlan Mud and learning how to use other colors by themselves and paired up with additional colors. Any advice for washing on a yellow base? I use gryphonne sepia but it stains the yellow so much that I have to cover all but the recesses with yellow again (actually tausept, wash sepia, 50/50 Iyanden/yellow, straight yellow, bright yellow highlight). Flekkzo: Yellow is a tough one. I might do the same thing I do with my reds and apply the wash carefully to just the recessed areas. That way I don't have that much to clean up and I'm not reapplying my enitre basecoat again after each pass of the wash.
Last year I painted some Warmachine minis and customized them for my gaming group and tailored them to their characters. This is when I started playing with "washing" but didn't own a single wash. I used a bottle cap to mix a wash from thinned darker Vallejo GC than the base color; then went back and highlighted by dry brushing on the original color and then a slightly lighter color on top of that. The effect was very nice and hooked me on washes. Since then I have purchased GW washes for a faster paint job. mcbaine37: The GW washes do speed things up a bit. Once you get used to using them, the real trick becomes which color to use when. What would you suggest when washing ove camo? I have done camo for my imperial guard. Its a winter theme so needs to be light colours so if i wash over how would i highlight it as i have a few colours dotted about, hihlight each colour? Chris Bell: Excellent question. I did a post on camo patterns on a Space Marine that might help out: Things I learned painting camo. 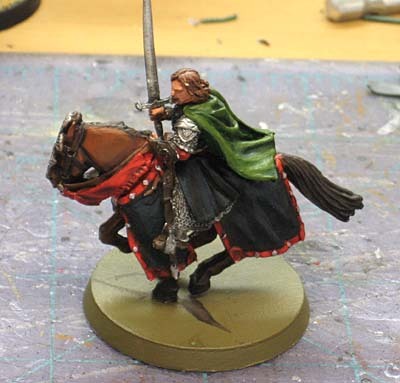 The short answer comes down to when you paint the pattern onto your model. Once you have pattern down, it can be very tough to highlight and your best best is shading after that. If your camo pattern is large enough, highlighting can be done over each individual color. If it's a small pattern, you might do best with a muted highlight color that covers most of them in general and don't worry about getting all of the smaller color variations.